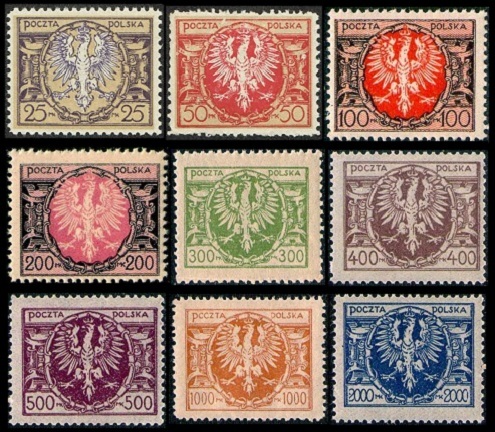 Re-designed definitive Polish stamps were issued, beginning in 1921. The period of hyperinflation that menaced all of Europe, between 1922 and 1924, also occurred in Poland, though its effects were not nearly as devastating, as they were in neighboring Germany or Hungary. This period would culminate with the issue of a 2,000,000 Marek denomination stamp in 1924, and it would witness the creation of a new Polish currency, the Zloty, which has survived to this day. 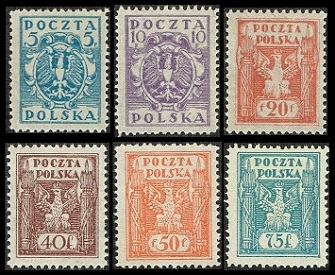 The nine new definitive Polish stamps shown above were issued between 1921 and 1923. They were printed on various types of papers, with the perforation gauges ranging from 9 to 14 1/2, including examples with compound perforations. 25 M. (1921 - Sc. #163) - Violet and Buff. 50 M. (1921 - Sc. #164) - Carmine and Buff. 100 M. (1921 - Sc. #165) - Black Brown and Orange. 200 M. (1923 - Sc. #166) - Black and Rose. 300 M. (1923 - Sc. #167) - Olive Green. 400 M. (1923 - Sc. #168) - Brown. 500 M. (1923 - Sc. #169) - Brown Violet. 1000 M. (1923 - Sc. #169A) - Orange. 2000 M. (1923 - Sc. #169B) - Dull Blue. 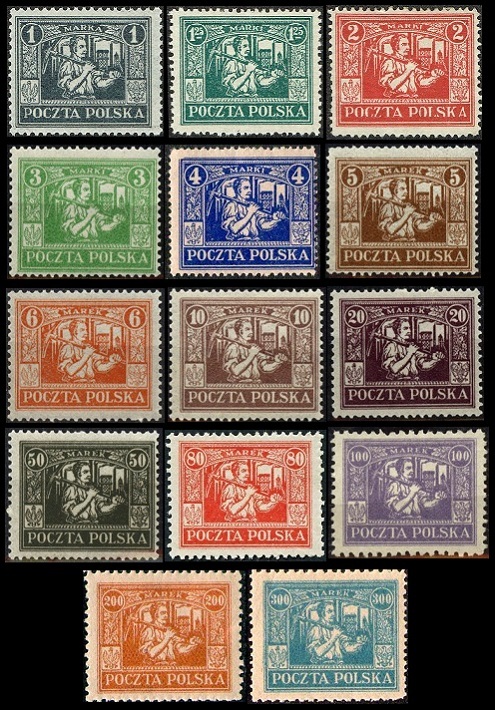 The twenty new definitive Polish stamps shown above were issued between 1922 and 1923. There were two different printings of these stamps. The first printing was printed on a flat plate press, and the perforation gauges range from 9 to 14 1/2. The second printing was printed on thin paper on a rotary press, and all the stamps were perforated 12 1/2. The Scott catalog does not list stamps from each of the two printings. The designs of the Marka / Marek denomination stamps features a miner. These were actually issued to celebrate the Union of Upper Silesia with the Republic of Poland. Many collectors view these stamps as commemoratives. 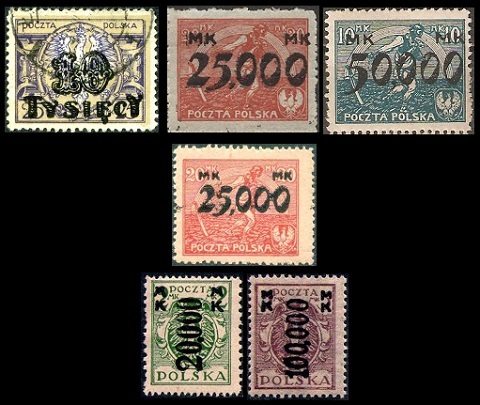 With the hyper-inflationary period in Poland, at the time, most of the lower denominations would have had no use for the payment of contemporary letter postage. Thus one could probably safely assume that most of these stamps were issued for consumption by stamp collectors. 05 F. (1922 - Sc. #170) - Blue. 10 F. (1922 - Sc. #171) - Light Violet. 20 F. (1922 - Sc. #172) - Pale Red. 40 F. (1922 - Sc. #173) - Violet Brown. 50 F. (1922 - Sc. #174) - Orange. 75 F. (1922 - Sc. #175) - Blue Green. 01 M. (1922 - Sc. #176) - Black. 01.25 M. (1922 - Sc. #177) - Dark Green. 02 M. (1922 - Sc. #178) - Deep Rose. 03 M. (1922 - Sc. #179) - Emerald. 04 M. (1922 - Sc. #180) - Deep Ultramarine. 05 M. (1922 - Sc. #181) - Yellow Brown. 06 M. (1922 - Sc. #182) - Red Orange. 10 M. (1922 - Sc. #183) - Lilac Brown. 20 M. (1922 - Sc. #184) - Deep Violet. 50 M. (1922 - Sc. #185) - Olive Green. 80 M. (1923 - Sc. #187) - Vermilion. 100 M. (1923 - Sc. #188) - Violet. 200 M. (1923 - Sc. #189) - Orange. 300 M. (1923 - Sc. #190) - Pale Blue. 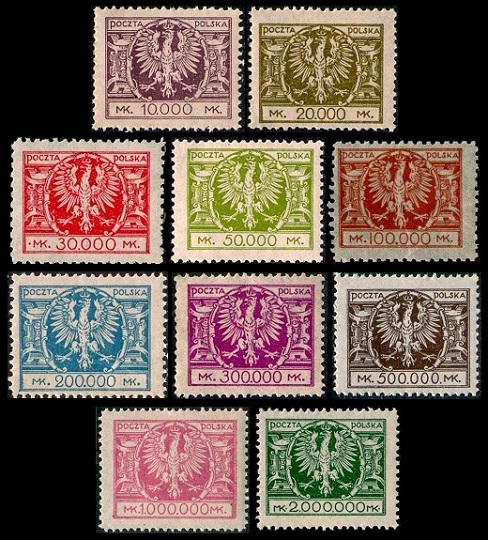 The six hyperinflation emergency provisional stamps shown above were issued during 1923 and 1924. These ten new hyperinflation denomination Polish stamps, based on the 1921 definitive postage stamps designs, were issued in 1924. These stamps were printed on thin paper, and their perforation gauges range from 10 to 14 1/2, including examples with compound perforations. 10,000 M. (1924 - Sc. #205) - Lilac Brown. 20,000 M. (1924 - Sc. #206) - Olive Green. 30,000 M. (1924 - Sc. #207) - Scarlet. 50,000 M. (1924 - Sc. #208) - Apple Green. 100,000 M. (1924 - Sc. #209) - Brown Orange. 200,000 M. (1924 - Sc. #210) - Light Blue. 300,000 M. (1924 - Sc. #211) - Red Violet. 500,000 M. (1924 - Sc. #212) - Brown. 2,000,000 M (1924 - Sc. #214) - Dark Green.